I am looking for crochet craft patterns using plastic bags. I have made a couple of door rugs for muddy boots by using bags--I just cut them into 2-3 inch strips and use a large needle. One I made by just crocheting a large circle, the other a large granny square. I used no patterns. I offer all my patterns free at my blog site of http://www.myrecycledbags.com from plarn (plastic bag yarn) patterns, fabric projects, crochet ideas and more. If you want just goggle my recycled bags and you can find me too. Sorry to bother you so soon, but I am looking for instructions for crocheting with newspaper bags. Can you help? Thank you. I'm interested in crochet patterns in fabric, where can I find these? 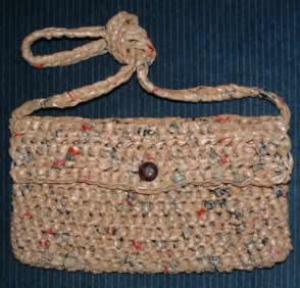 I'm also trying in find crocheted bag patterns that use plastic or wicker handles. Check out my website http://www.myrecycledbags.com where I have free patterns, tips, and pictures of projects using recycled plastic bags. Check it out for great eco-friendly craft ideas.